A puppy grows amazingly quickly during its first year of life. A puppy can grow from about 450 g or less at birth to 22 kg pounds by its first birthday, which is astounding. For the first couple of months its mother can provide its nutritional needs, but then it's up to the owner to see to the puppy's diet. Until it's about half grown a puppy will need about twice the energy needed to maintain its body, then it’ll need 50 percent more energy till it's grown. To know how many calories to feed a growing puppy, the owner will need to know what it's adult weight is going to be, which admittedly can be tough if the puppy is a mixed breed. But if the person figures that their puppy is going to grow into an active dog that’ll weight about 50 pounds when they're grown, it will probably need about 1,400 calories for body maintenance. So, for the first six months a puppy will need 2,800 calories a day, then 2,100 calories for the next six months. One rule of thumb claims that a growing puppy's diet should have at least 22 percent protein and 5 percent fat. Though dogs can get all of their amino acids from vegetables, a vegetarian diet isn’t the best for a growing puppy, whose system was made to work best with a mostly meat diet. Fat gives the puppy energy and makes the food taste good. The amount of fat and the type of fat the puppy eats will affect not only its weight, but can affect its immune system as well. Fiber is also important, for in the wild a dog would eat the fur and the intestinal and stomach contents of other animals, which would usually be herbivores. Fiber can slow down the absorption of food and digestion and can help in preventing constipation, diabetes, obesity and too much fat in the bloodstream. Though some puppies grow more rapidly if they’re given raw meat to eat, raw meat is dicey, as it might contain bacteria or parasites. The puppy shouldn’t be fed meat exclusively whether cooked or raw, because meat and nothing else imbalances the calcium to phosphorus ratio in the dog’s body, which can eventually lead to bone disorders and cardiovascular failure. Remember that a wild dog eats just about everything of their prey, including what the prey has eaten. The best food for a growing puppy is cooked poultry. One hundred grams of chicken meat has 121 kcals of energy, 20.5 g of protein and 4.3 g of fat. Chicken meat with the skin has even more energy, even though it only has 17.6 g of protein and 17.7 g of fat. Rabbit, on the other hand, has 124 kcals of energy, 22 g of protein and 4 grams of fat. As for fiber, beet pulp, rice bran and bran breakfast cereals can also be fed to the puppy, as can psyllium. Some high quality puppy foods have a good balance of protein, fats, fiber, carbohydrates, vitamins and minerals. However, the owner should be careful of giving the puppy food with too many kcals of energy. This sort of food causes fat cells to be created, which might lead the dog to obesity. A fat puppy is cute, but it’s not healthy! Jane is a veterinarian of 22 years and says it is a common mistake for people to use the wrong puppy food. By following her tips you can ensure that your puppy's diet will full of all the nutrients it requires. When Jane isn't working, she enjoys spending time with her family, travelling, hiking and swimming at the beach. Dr. Karen Becker of HealthyPets.Mercola.com discusses causes, symptoms, home care and knowing what to do ahead of time, when your dog gets diarrhea. I think it’s time for another discussion on how to handle the problem of doggy diarrhea. I’ve talked about this issue in other videos and articles here at Mercola Healthy Pets, but it’s such a common problem I think a refresher every now and then is a pretty good idea. I decided to make this video in honor of my friends and family who, between Thanksgiving and Christmas, flooded my email inbox and voicemail with dozens of calls about this issue. These are people who are seasoned dog owners, but just wanted assurance they were doing the right thing. Since many of you probably don’t have a vet in the family you can call, this video can serve a similar purpose. The content is exactly what I explained to my loved ones. And actually, now that I have a video on the subject, I’ll just refer them here when future calls come in! If you own a dog, chances are you’ve lived through at least one bout of doggy diarrhea. It’s not a matter of if it will happen – just when. When will your dog get diarrhea? Knowing ahead of time the steps to take when your dog develops diarrhea or loose, watery stools can give you peace of mind when the time comes. And as we all know, the time will come! There are a lot of reasons dogs develop loose stools. The most common reason is dietary indiscretion, which means your dog ate something she shouldn’t have. This was the cause of all the phone calls and emails to me over the holidays. During the holidays, when people are cooking and hosting a lot of events that involve food, a really ripe environment is created for the ingestion of new foods dogs have not consumed before. Sometimes it’s leftovers that cause GI upset. And sometimes, owners don’t even know their dogs have gotten into food. That was the situation in my home, actually. My dogs were tearing open the garbage bags that we had put outside by the garage. They foraged all afternoon and into the evening on a feast of leftovers and we were clueless until we came upon the mess. Many dogs spend much of their time sniffing around the house for morsels and tidbits anywhere they can find them, including gas grill grease traps, bathroom garbage cans, bird feeders, bird baths, ornamental ponds, and certainly the garden. Another cause of diarrhea is a sudden change in a dog’s regular food. Also allergies to certain foods and poor quality dog food in general. I see a lot of kibble-related diarrhea in dogs. Parasites like giardia can cause intermittent diarrhea. This microscopic parasite causes a wax-and-wane type of diarrhea that just pops up out of the blue. And about the time you think you should call the vet, the stool firms up on its own. You assume all is well – until another bout of diarrhea occurs days or weeks later. Viral and bacterial infections in the digestive tract can cause diarrhea. So can certain medications such as heartworm preventives. Even stress can bring about an episode of diarrhea in dogs and puppies. While you may think nothing very eventful is going on in your world, your dog can experience stress over even a slight change in routine. Suddenly you’re looking at a bout of watery doggy poop that seems to have come out of the blue. The most obvious symptom of diarrhea is when your dog is standing anxiously at the door and needs to get out quickly. Once he’s out he runs urgently to a spot and often passes loose, watery stool. Or … you’re not around when the urgency hits and you find an accident on the floor when you get home. A less obvious and often confusing symptom of diarrhea can be when your dog strains to go. It actually looks more like constipation than diarrhea. Diarrhea upsets the normal rhythm of the muscle contractions in your dog’s intestinal tract. This can give him the sensation that he constantly needs to poop. So even though he’s hunched over and straining, his colon could be empty from repeated bouts of loose stool. Other symptoms that can go along with diarrhea include fever, lethargy, malaise, loss of appetite, and dehydration. Most healthy dogs experience an occasional episode of loose stool or diarrhea and it’s done – over with. It resolves all by itself. In this instance the underlying issue is probably something she ate she shouldn’t have, or perhaps stress was the trigger. But any dog has the potential to become very ill from chronic bouts of diarrhea. Puppies, small dogs, and seniors are at higher risk of dehydration from just one round of explosive diarrhea. It’s important to make sure that your pet has access to clean drinking water at all times, and encourage your pet to drink if you can. If your dog seems fine after a bout of diarrhea -- meaning she’s acting normal, with normal energy – it’s safe to simply keep an eye on her. But if you notice she’s also sluggish, running a fever or feels warm to the touch, or there’s a change in her behavior, I certainly recommend you contact your vet. If you see blood in your pet’s stool or she’s weak or shows any other signs of debilitation along with the diarrhea, you should make an appointment with the vet. If your dog seems fine but is experiencing recurrent bouts of diarrhea, you should make an appointment. It’s important to bring a sample of your dog’s stool to your appointment, even if it’s watery. Use a plastic baggie and shovel a bit in there to take with you. This will help your vet identify potential underlying causes for the diarrhea. If your pet is an adult, otherwise healthy, and behaving normally except for the diarrhea, I recommend you withhold food – NOT WATER – for 12 hours. At the 12-hour mark, offer a bland, fat-free diet. I recommend cooked ground turkey and plain 100 percent pumpkin. Cook the ground turkey to remove grease and extra fat. And make sure the pumpkin isn’t pie filling, just plain canned or fresh cooked. If you can’t find plain canned pumpkin, substitute cooked sweet potato or even instant mashed potatoes. This is a different bland diet from the traditional ground beef and rice combination that is often recommended. Even the leanest ground beef contains a lot of fat, and fat can worsen a case of diarrhea. Rice, even though it’s bland, is very fermentable. Fermenting rice in the colon of a pet with diarrhea tends to increase gassiness. Also, rice tends to just zip right through the GI tract, exiting with the next bout of explosive diarrhea totally undigested. Because of its large surface area (when compared to kernels of rice), many pets do much better with pureed pumpkin or sweet potato. Even through a bout of diarrhea, it is readily absorbed. Mix the cooked ground turkey and pumpkin or sweet potato 50-50 in your dog’s bowl. Feed 2 to 3 small meals a day until stools are back to 100 percent, which should happen in about 72 hours. My favorite all-natural anti-diarrhea remedy is an herb called slippery elm bark. I recommend always having some on hand so when you need it, it’s right there. You don’t have to run to the store. 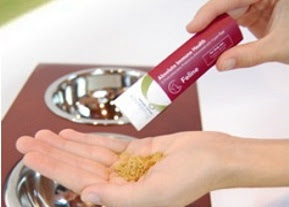 Slippery elm is safe for puppies, adults, and geriatric dogs and it is completely safe blended with other medications. I recommend about a half teaspoon for each 10 pounds of body weight, mixed into the bland diet twice daily. I also recommend you add in a good quality pet probiotic once the stool starts to firm. Feeding a bland diet and supplementing with slippery elm bark is a good plan for about 3 days, at which time your dog’s stool should be back to normal. If after 3 days the diarrhea hasn’t cleared up, it’s time to check in with your veterinarian. 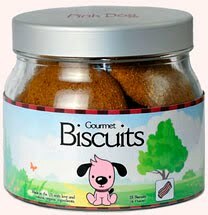 Pink Dog Bakery is offering Free Samples of their Gourmet Dog Biscuits. "Pink Dog Bakery has been providing the highest quality gourmet dog biscuits and cupcakes with the best possible service to dog lovers and their dogs all over the United States. Each product has been taste-tested by dozens and dozens of dogs from all different breeds, to ensure universal appeal, and this family business has grown, employing several doggy-chefs to meet the ever-increasing demand, as Pink Dog Bakery has grown to be one of the largest providers of gourmet dog treats in the country." For a limited time, Pink Dog Bakery is mailing out Free Samples of Gourmet Dog Biscuits. This trial pack of 4 biscuits lets you try all their flavors, including Bacon Biter and Chicken Craver! Purina and Petcentric.com are offering everyone the chance to get a Free Puppy Care eBook when you sign up for their email communications. Along with the Free Puppy Care eBook, you will also receive expert tips to keep your puppy happy and healthy, as well as offers and samples. Make sure you check the "Send me email communications from Purina and Petcentric.com" box to get your Free download of the Puppy eBook. With the recent rise in the number of heartworm-positive tests on dogs in the USA, Veterinarians and the American Heartworm Society (AHS) are urging two things, firstly that all pets should get a heartworm test once a year and secondly, for any owners who do not currently have their pet on a heartworm preventative medicine to protect their pets with one of the approved medications available. It is a sad fact that despite all the efforts of the AHS, by their own admission, they have not been successful in persuading many pet owners throughout the USA of the vital importance of using approved heartworm preventives; with the result that infection rates are running at an all-time high because mosquitoes are biting infected dogs and spreading the tiny heartworm larvae to new hosts. Animals who are on preventative treatments will be protected as the medicine will kill these larvae before they develop into adults. However, for unprotected pets who get bitten by infected mosquitoes, the sad truth is that they will go on to develop the devastating effects of infection with adult worms as these larvae grow and mature into breeding adult worms. Thus, the spread of the disease marches relentlessly onwards. Safe and effective, approved preventatives are available - and when compared with the cost of treating a dog affected with adult worms, either with Immiticide, or in very severe cases, with surgery, are extremely inexpensive. In addition, by comparison with the heartache of having to watch a much-loved pet go through heartworm treatment or even worse, of having to have a pet euthanized because the cost of surgery is not feasible, preventive treatment is the only sensible option. Preventatives are usually delivered in two main types, either a monthly pill or chewable, or one of the 'spot-on' preparations which are spotted between the animal's shoulder-blades and usually also deal with fleas and other parasites. If your pet is not currently on a preventive, your vet will not be able to prescribe one unless your dog tests negative for heartworm infection. A sample of the pet's blood is analysed under the microscope to see if any of the tiny larvae are present. If the blood is clear, your pet can start on whichever medication you and your vet decide is best. If heartworm larvae are found in the blood or an antigen test is done and proves positive, this means that your dog, even if he is not showing any symptoms, has become infected and has adult worms affecting the heart and lungs. In this case, your vet will advise you about heartworm treatment. Heartworm disease is another one of those instances where prevention is very much better than trying to cure an infected animal. Preventative treatments must be prescribed by a vet because of the importance of ensuring that your pet is free of the infection before starting the treatment. Should an infected dog be given preventatives, this could have serious consequences for the pet and in very rare cases could even prove fatal. "In spite of all we know about heartworm - and our ability to diagnose and prevent it - we have not been successful in substantially decreasing incidence of heartworm disease. We must do more to help veterinarians and their clients follow our guidelines for heartworm screening and prevention." The Importance of Heartworm Prevention in 2012 is a Guest Post by Alison Graham. Alison Graham is publisher of Heartworm Treatment For Dogs, a web site dedicated to providing information about heartworm and other dog health issues. We all have heard the statement that “dogs are person’s best friend.” But dog owners really understand the truth behind that statement. Dogs become part of the family and bringing them along on vacation is a treat for them and makes your trip that much better. Traveling with a dog is a very rewarding experience for the both of you. The ability to take your dog with you on extended stays and still have the companionship that it brings is second to none. But, when dogs travel there are precautions and equipment that must be in place to keep your pet healthy and comfortable during the trip. Make sure that your dog has been taken to the vet prior to a long trip. Your vet should be able to tell you the dog is healthy enough to travel and is caught up with all of its shots. They will also be able to inform you of ways to keep your dog healthy while you travel. Be sure to give your dog plenty of food and water. If your dog has been in the heat, he’ll be in need of water and food. Dogs left in the heat without water and food can end up getting sick or worse. If you stop for a break, then give your pet one too. Your dog will need time to run and burn off excess energy. They will also have the chance to take care of business so there won’t be accidents while in the vehicle traveling. If you’re catching a flight your dog can fly too. Unless you have a seeing eye dog your canine companion won’t be able be able sit up in first-class with you. Dogs can catch the flight too but it will be stored down in another compartment inside of its traveling container. And to answer a common question, it’s not a good decision to give your pet medication to sedate it before a flight. One important item that you should have for your dog is a cage that he can call his own. The cage is more than just a place to keep your dog secure and safe. It is a place that he will be able to be comfortable in and relax in, surrounded by familiarity. Inside of the cage there should be items that are familiar to your dog. There should be some toys, blankets and even dishes that your dog loves to use. You will find that the more familiar your dog is with the better they will take the travels and the new environment. Your dog should also have a travel health insurance policy that will cover it if a vet is needed while on vacation. Pet insurance is a way that your pet can see a vet without costing you a fortune. After all when you purchase health insurance for yourself you should also get some for your pet. Be sure to have your dog’s collar with you at all times. Your dog should wear its collar just in case you get separated from it and a pound collects the dog. With the proper identification they will know that it’s a pet and not a random stray dog. The collar should have the license and contact information needed to reunite you and your dog. Traveling with your Dog is a Guest Post by Maire Hunter. Maire enjoys baking double chocolate brownies and walking her Scottish Terrier, Pete. It seems like every other day there is a story on the news or an article in the paper warning us that we are slowly becoming an obese nation. Everywhere we go we are reminded about the number of calories in what we are eating and even popular fast food chains like McDonalds now offer up 'healthy alternatives'. Now it seems like our 'fat culture' is slowly encroaching on other areas of our lives - our pets. You'd be shocked at the number of dog owners who are completely unaware that obesity can actually be a problem in pets. In fact there are a number of people who might actually find a chubby canine or fat feline funny. Unfortunately, obesity in pets is not a laughing matter and there are some serious health implications that can arise from raising an overweight dog. Technically an overweight dog and an obese dog are two different things. To classify as obese, a dog must be 20% above its ideal body weight whereas an overweight dog needs only be 10-19% above their ideal weight. When we give a dog more energy in their diet than they actually need, the energy is stored in the body. This energy can be stored as fatty tissue, which builds up around the internal organs. If our pets aren't given a chance to burn off this extra energy, the fatty tissue continues to grow and your pet's weight continues to increase! Allowing fatty tissue to build up around the organs is definitely not great for your pet's health! It can increase the work load of the organs, from the heart to the liver - putting extra daily strain on these vital organs can lead to serious problems. One of the more obvious issues is that an obese pet is carrying around much more weight than their body was designed for! This can put extra pressure on the joints leading to damage and possibly even medical conditions such as osteoarthritis - a degenerative joint disease. Unfortunately there is only one reason for our pets' obesity problem. Us. There are two aspects to the obesity problem, diet and physical activity. If our personal lives are busy, it can be difficult to find time to talk the dog out but just like us, they needto be active. If you aren't ensuring that your dog gets active, then all the energy they consume in their diet is just going to get stored in their bodies as fatty tissue. Portion Size: Good quality dog foods are becoming increasingly enriched with nutrients and energy; this is great news for our pets and us! Unfortunately, it does mean you are going to have to take care when dishing up your pet's meal. Because pet food is so energy rich compared to the dog's size, even a few extra grams can add to the calorie count. Over time, if we continue to over estimate portion sizes, those extra calories can certainly add up! What to do: Make sure you refer to the manufacturers recommended portion guidelines on the back of your dog's food. It might be worth measuring out the portion exactly using an old measuring jug or cup and some kitchen scales. You can then mark a level on the jug that indicates one portion - making every following mealtime more accurate! Remember, dogs should be fed ideally twice a day. Diet Quality: There is a huge variety of pet foods on the market, some of them a lot better quality than others. You can imagine poor quality foods, being like feeding your pet junk food each day - it might give them the energy they need, but it isn't going to do them much good in the long run. What to do: Don't be afraid to spend a little extra on a good quality dog food. Look out for foods that are specific to your dog's breed or life stage (e.g. puppy, adult, senior). If your pet is overweight, there are plenty of weight control diets available. 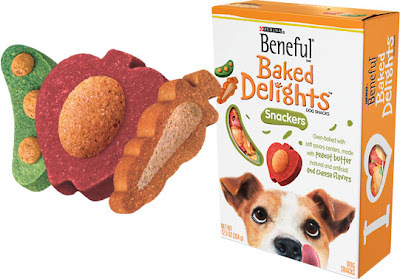 Treats and Tidbits: We all think our pooches deserve a treat every now and again, and they do! But just be careful as to how many treats you are giving. Treats are exactly that, a treat! They are often filled with calories to make them really tasty, so they can quickly add to the daily calorie count. Tidbits, are those little scraps of our food we give to our dog, just like treats, the occasional tidbit isn't going to hurt - but if your pet is clearing up your plate after every meal, again, the calories can mount up. What to do: Restrict how many treats you give your dog and keep those tidbits to a minimum, try not to give in to those puppy dog eyes! If you have guests over, be sure to tell them not to feed your dog as he is watching his weight! Yes it is true, we may unwittingly be raising a generation of fat dogs, but if you watch what your pet eats and keep them active they will keep those extra pounds at bay. Obesity really is a growing problem in our pets, it's not just dogs - cats are becoming chubbier too! So be sure to spread this advice and let's keep our pets fit and healthy! Grooming Your Labrador Retriever is a Guest Post contributed by Emma Green. If you own a Labrador Retriever, consider yourself very lucky when it comes to grooming your dog. As a groomer for several years, I have had the pleasure of grooming some very sweet Labradors, and they were always some of my favorite dogs to groom because of their sweet disposition and their love of water. You will want to start out your grooming session by giving your Lab a good bath. Chocolate Labs tend to be more prone to skin allergies, but any dog can have allergies so you will want to check your dog’s skin before you begin bathing. If you notice any red spots or blotches under the fur (especially around the belly) or if your dog has been itching or sneezing frequently, try and find an oatmeal shampoo for dogs. This is available at almost any store that carries pet products. If your dog doesn’t appear to have any sign of allergies, you can get a regular dog shampoo. I prefer to bathe dogs in a bathtub, but you may want to wash your dog outside if it is warm. Though many Labradors love water and welcome a bath, if your dog is scared of water, be really gentle and make sure that he is secured in the tub or tied to something outside with a leash. Having your dog tied to something on a very short leash will make things a lot easier for you, and allow you to focus on cleaning him without worrying that he will escape. After he is totally wet, you will scrub shampoo into his whole body. Be liberal with the shampoo. There should be soapy suds from head to toe (but please avoid the eyes!). After he is all soaped up, rinse all of the suds off. If he is very dirty, you will probably want to do another round of shampoo. Optionally, you can get a good coat conditioner to use so that his hair will be very soft. Put the conditioner on after you have rinsed out the last round of shampoo. Let the conditioner sit on his hair for about 5 minutes, and then rinse it out. Make sure all of the suds and conditioner are totally rinsed off, or your dog could be itchy, and oily. Use a large absorbent towel to dry him off. Do not allow him to run around outside until he is 100% dry, or he will be dirty again in 5 seconds. To speed the drying time, you can use a hair blow dryer. Just make sure that it is set to the “cool” setting, so that your dog doesn’t overheat. The final step is that after he is dry you should run a wire slicker brush or a comb over him to get some of the loose hair out. He will be shedding more than usual for a few days after the bath because you have loosened a lot of the hair. Doing a final brush will help get some of that hair out, and you may want to follow up for the next couple days since he will be shedding more. If you know how to clip the toenails you will want to do it at the end too. I don’t recommend clipping the nails before a bath because if you clip any of them too short, the water from the bath will make them bleed more. You now have a clean and happy Labrador Retriever! Prudence - Nature's Wellness is offering a Free sample of their nutritional supplements. From Prudence: "We know the best way for your pet to love our products is to actually try them. So, we are offering you a free sample to get acquainted with our line of supplements and to see just how easy it is to give your pet the nutrition they need without the pills you both hate to use. Simple fill out the form below and we will send you a free single-serving packet of our nutritional supplements for either your dog or cat." Free samples of Prudence Pet Nutritional Supplements are available to residents of the United States and Mexico only. 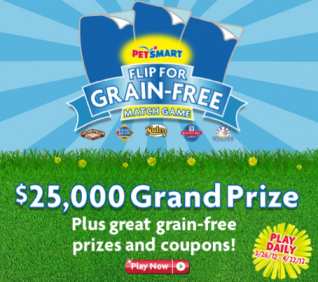 Play the new PetSmart Flip For Grain-Free Match Game and you will have a chance at winning $25,000 or grain-free pet food prizes! The top 5 high scores for the day will win a $50 Petsmart gift card. Once you complete level one, you will also have the opportunity to see if you were awarded a or $5-off one (1) bag of grain-free pet food coupon. Owning a dog is a big responsibility. Your dog requires all sorts of love and care, and while training and housebreaking a dog are important, cleanliness is also a crucial part of your dog’s life. Even dogs are bothered by messes in the home. An indoor dog potty can be a big help in maintaining cleanliness, but stay away from a fake grass dog potty, which will only cause a huge mess. Of course, aside from keeping his immediate surroundings clean, your dog deserves a little pampering every now and then. Here are a few dog grooming basics. Trimming your dog’s nails is probably the hardest aspect of grooming. Both dogs and owners seem to dread it. Many dogs hate just having their paws handled, and owners are often afraid of hurting their pets. This is mainly from the structure of a dog’s nails. The quick (the pink part of the nail) contains nerves, so cutting into it will cause pain and bleeding. Hold your dog’s paws gently and be careful when cutting the nail, making sure not to get close to the quick. There are numerous devices for trimming your dog’s nails. If the basic trimming tool is a bit too difficult, you may consider using an alternative rotary tool that files the nails down. Nail trimming should be done at least once a month. Contrary to nail trimming, most dogs love a good brushing. Brush sessions can strengthen the bond between dog and owner and will help to maintain a healthy, knot-free coat. Brushing frequency depends on your pup’s fur length. Short-haired dogs can get away with a brush a month. Medium-haired dogs are prone to matting and tangles, so try to brush at least once a week. Long-haired dogs require daily brushing to prevent mats and tangles. You may even have to brush twice in a single day. Still, despite the length of your dog’s hair, you can brush your dog daily, especially if he likes it. Increase the frequency of brushings during shedding seasons. Above all, avoid pulling the brush through matted hair. Try to pull it apart with your fingers before brushing. If it’s too tight, you may need to shave the area. Certain dog breeds, like the poodle and Shih Tzu, have continuously growing coats and need their fur cut every two to four weeks. You should take your dog to a personal groomer, but many dog owners learn some basic haircutting techniques. The style is up to the owner, but behavioral scientists have found that dogs do actually get embarrassed. If possible, avoid completely shaving your dog’s fur. It’ll save him the embarrassment.